Mouse - scroll screen + use actions on bean peeps. Click on a bean peep to select him or her. I wanted to make a game where you could try out the recommended 'strategies' in a dynamic environment. I believe people learn best by doing and a game is a great and safe place to explore these strategies. 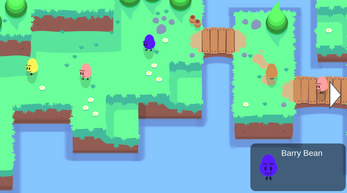 I've made a bunch of little colourful bean peeps that wander through the level. Some of them are bullies. Try to stop the bullies and help the victims. There's no end goal - I probably could track how many 'sad' people had reached the end of the level and set a limit on that. Doesn't work - work in progress. Works, but has no effect - work in progress. Idea was for peeps to go find a nearby bully and then stand up to that bully and say 'STOP' if you clicked on this. Pick a bully and give him a good thump. Why include this? Well, it's a game, and you should be able to do the wrong thing as well, and see what the consequences are. Bashing bullies feels good, but it doesn't achieve anything. Bashed bullies will keep on bullying. The bean peeps form little groups and discuss topics. They don't leave the group and kinda get stuck there. I had planned to turn these into 'semi' realistic mini echo-chambers where a particular topic starts to dominate, dissenters get ejected and members of the groups' opinion of that topic become skewed. A group like that would spawn bullies.